Everyone likes a clean, shiny new car, especially here at Henley Honda. And besides having a ride that looks awesome, keeping your vehicle clean has some other perks too. Unfortunately, cars don’t stay that way without some effort on your part. There are a few basic things that you can do to keep your car clean of dirt and grime inside and out that will help to keep your car looking great and in excellent condition. After the long winter we had here in the Niagara Region, it’s important to wash your vehicle to ensure that all the leftover salt from the roads isn’t hiding somewhere, especially on the undercarriage. And now that summer is right around the corner, washing your car regularly will help to keep the paints surface clean and protected. If a build up of bugs or dirt is left on your car’s surface, it could cause chipping or fading of the paint. When you are going to wash your car, make sure it is out of direct sunlight and that the surface of your car is fairly cool. This ensures that some parts of your car aren’t drying faster than others, which can result in dirt smudges. Also, be sure to only use products that are dedicated as a car-wash product — if you use a dish detergent it could cause damage to your vehicle’s body. Drying your car after it is washed is key in making sure your vehicle is actually looks clean. When you leave your vehicle to air dry, watermarks could appear — which is not something you want after you spent so much time and effort cleaning it! For best results, use a microfiber cloth to blot the water from your car and leave an evenly dried vehicle. Waxing may not always look like it does anything more than making your car shiny, but it actually protects your vehicle’s body. Wax fills all the micro scratches that are on your paint’s surface and helps to prevent them from getting larger and possibly chipping. With summer approaching, trips to the beach or cottage are likely in the books, and no one likes sand or dirt in their cars. 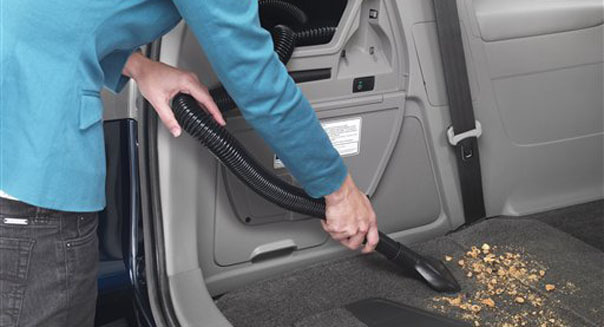 Regularly vacuum the seats, floors and mats to keep your interior clean and smelling fresh. And don’t forget about vacuuming your trunk space every once and a while too. Don’t eat in your vehicle — Besides being a distracting and dangerous habit, no matter how careful you are, you will drop crumbs and leave a mess behind. Knock your shoes off before you get in — As you walk around all day, your shoes pick up dirt and gravel, so if you don’t want to vacuum constantly, get that dirt off before you get in. Make a regular routine for washing — Incorporate a car wash into a bi-weekly routine to make sure it just happens. When it becomes habitual, there’s nothing to worry about. Clean messes up right away — Accidentally spill your morning coffee or step in a mud puddle getting in your Honda? Make sure you clean it up as soon as possible to prevent permanent staining. Keep a trash bag in your vehicle — If there’s a trash bag handy, you won’t be tempted to toss your trash on the floor. With the weather getting nicer (finally! ), it’s time to get out of the house, spend more time outside! Washing your car can actually be enjoyable in the beautiful weather! And if you don’t want to do it yourself, let us know — Henley Honda can help!